After getting the wort into the fermenters yesterday at Upstate Craft Beer Co., headed over to Birds Fly South Ale Project's new location to join in on a bottle-share and fundraiser. 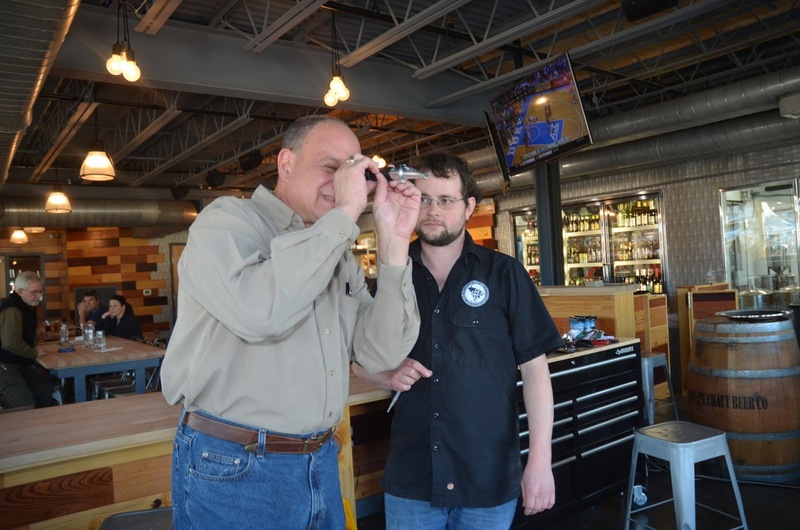 After tasting several rare and astounding beers and hearing Shawn discuss his plans for the facility, forced myself to move on. In this case to Brewery 85's Second Anniversary party. What a crowd! Lots of fans of Will and Jeremy's beers there. Dogs and kiddies in equal numbers too. Good music, good beer and what promised to be a fantastic sunset, even tho Will yelled "last call" at 5 pm. Great day for me and an equally great day for Greenville's craft beer community. More photos and details coming soon!! 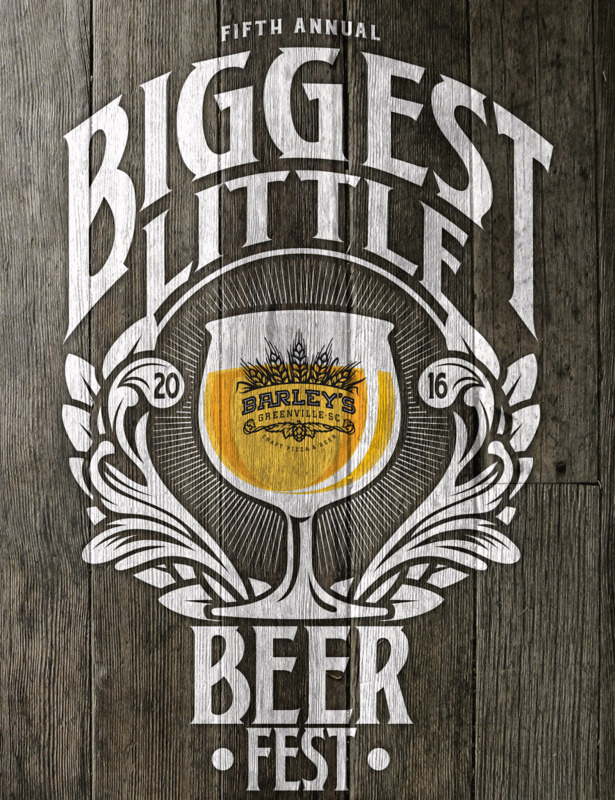 Labels: #beerporn, #Chinook, #citrahops, #craftbeer, #gvlbeer, #IPA, #SCBeer, Upstate Craft Beer Co..
Well, Barley's Fifth Annual beer fest is now history, joining the ranks of the other four fun times. I think I'll take this opportunity to reflect back on how I experienced the event, talk about the new beers I tried and the new friends I made. Thanks to Drew Moren for his assistance. Belgians hang out. 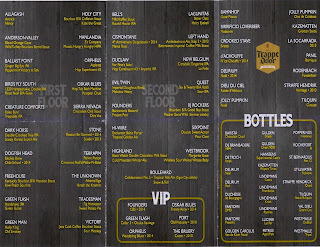 Plus for VIP ticket holders, there is the library room where very special beers are on tap, and you are surrounded by aging rare bottles which can be ordered off their reserve menu. Creature Comforts Brewing is in Athens, GA., so far I've not been able to visit them but I was able to sample their Tropicalia IPA, their only offering. At 6.5% abv and 65 ibu's it's got a refreshing citrus nose and palette, plenty of hops to tame the sugars and well balanced finish. Quickly became one of my faves. Now, I really need to visit the brewery. Manlandia 2.0 Brewing, home brewed by Jason, offered up their Mosaic version of the H.I.P.A. which I also enjoyed; very citrusy and solid palette balance. Could easily become a favorite, tho hard to find. Cismontane Brewing poured their Marea Roja, a sour Flemish Red which was barrel aged. Not overly sour, reddish color, light body. Easy sipper, I'd say. Holy City has two very limited release beers and it would have been a shame to miss out tasting them so that's why I go to events like this. First was their Kate the Great, a Belgian tripel aged in red wine barrels. If you've had their That's What She Said then you've had the base beer for this one, without the barrel aging. Btw, the beer is named after Kate Brown, the Brewmaster Chris' wife. Brewed originally for their wedding. At 8.8% abv, it's a bit stronger than usually found in that style. Very drinkable. Their other beer was the Bourbon B/A Collision Stout, an Imperial Stout. Big at 8.5% abv, this winter seasonal will definitely warm whatever is chilling you! A brand new brewery for me was DuClaw Brewing, from Maryland. I tried their Hop Continuum #3 Imperial IPA which with 75 ibu, it was my style preference. Another big one, 8.9% abv, is light in color but heavy on hop flavor. I meant to go back for more but ran out of time. HIghly recommended. I've long been a fan (and many years a neighbor) of Lagunitas Brewing, in Petaluma, CA. They had one of their OneHitter Series, Bitter Oaks available, one that I've not had before. Being a fan of oatmeal adjuncts in general, this one did not disappoint. Described as "This big boozy blonde was brewed with a boatload of oats," on their website, I liked the tartness, very dense head as you might expect. Lagunitas typically doesn't list IBUs but the abv is 10.5%, so you know it's a big hop bomb. Recommended as well. A very familiar name, New Belgium (about to open in Asheville, NC) came up with a new favorite of mine, their Citradelic Tangerine IPA. Ok, I know, lots and lots of variations of IPAs these days, but this had citrus in the nose (orange and tangerine) citrus in the body and refreshingly citrusy in the finish, almost like a palette cleanser. The website calls it, "a mystical marriage of Citra hops and tangerine peel..." I called it yummy!!! More! Winding up my list of favorites (every beer there was a well made, wonderful beer but I could only choose so many) are the offerings from one of my favorite South East Coast breweries, Westbrook from Mt. Pleasant, SC. First up of the two, a bourbon barrel aged version of their Weisse Weisse Baby Berliner Weisse, Whiskey Sour. Lots of wheat as the name reveals, but the sour bourbon flavors elevate this to special status. Only 4% abv, so if I had the time I could drink this one all day long. Their other beer was equally captivating, a Margarita Gose. Aged in tequila barrels with lots of lime additions, this made me want margaritaville to get here soon! Definitely a summer sipper. Very tart, perhaps a little saltiness but a welcome addition. This may be a limited release but should you see if offered this year, go for it!! 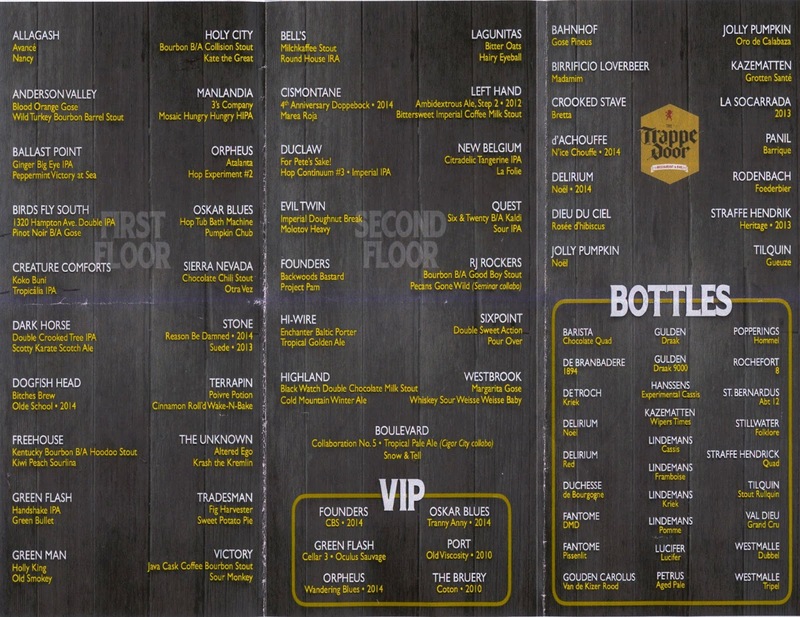 So far, I've not even mentioned the Trappe Door where the Belgians to to play. If you want to see what was available, Barley's website has the list. I had a De Troch Lambic Kriek filled with cherry flavor but enough sour to keep it from being cloying. I also tasted a Petrus Aged Pale by De Brabandere, aged in oak, a very effervescent yet sour pale ale. I owe it to all those Belgian brewers to learn more about their traditional recipes and appreciate them more as well. We are fortunate here in Greenville to have a Belgian-centric pub, with good food as well. 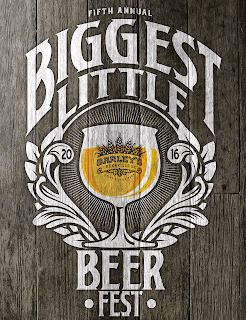 Big festival, lots of choices for craft beer lovers and full of opportunities to learn more. 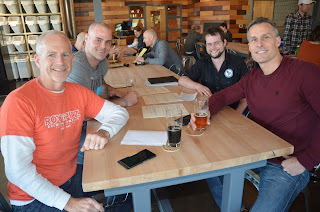 For example, a guy named Mike Smith, here with two friends in the photo, told me to be sure and visit The Black Cloister brewery if I'm ever in Toledo, Ohio. It could happen! So, the first festival of the year is past, now time to look to Asheville and this weekend's Winter Warmer. So many beers, so little time!!! Tarver says, "see ya next year." 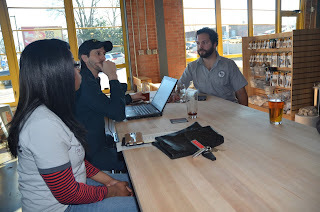 I stopped by Upstate Craft Beer Co. to get their spent grain, which Kay uses as a soil amendment, and discovered a radio broadcast going on, plus some beer lovers who are going to brew their own (an option offered by Upstate) involved in their pre-brew fest consultation. Chris obviously had a very busy day. Jeff Gerber, Summit Media rep, checks the Final Gravity of the IPA brewed today as a station promotion. Chris was pleased with the numbers. Jack, right, helps with the radio broadcast, all digital of course. One of the first groups to brew their own on Upstate Craft Beer Co.'s system. Left to right, Jim Novak, Cory Croissant, Chris Hardin, Brewmaster and Jeff Bauer pose for the interruption of their consultation with Chris. And at the end of a busy brewday, what do you get? In this case, two half-barrel fermenters full of Interstellar Pale ale, just needing couple weeks of fermentation, thus the air lock. Very educational day for me; learned to smash a yeast pack, what a hop-spider is and how to connect the pump for a sparge of the mash. A tiring and satisfying day, to be sure. I'll let everyone know when the keg(s) are tapped. Upstate Craft Beer Co.